How does the ‘NYC Train Sign’ MTA countdown clock work (and is it worth it)? You might have recently scrolled past an advertisement or were tagged in a social media post for the NYC Train Sign. 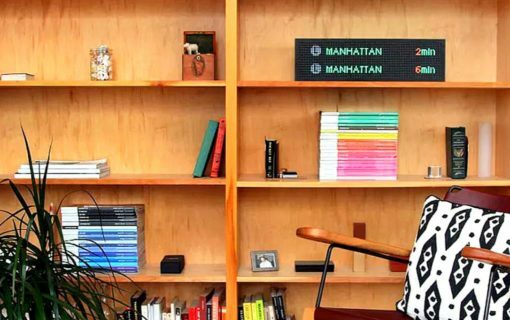 The NYC Train Sign is a replica of the subway countdown clocks you’re accustomed to seeing at some of the subway stations in New York City, but made for your living room. We haven’t gotten our hands on one yet, but from what we’ve seen, it’s an impressive-looking product. It looks just like the countdown clocks except on your IKEA bookshelf. And how the company staged the 20W x 5H x 2D inch sign in their promotional images really highlights the simple beauty of sign. How Does the NYC Train Sign Work? The company boasts real-time MTA data for the train stop of your choice with real train times for both directions, but how does it get that info — how does NYC Train Sign actually work? Without getting too technical, each sign is custom-built and created using Raspberry Pi technology. 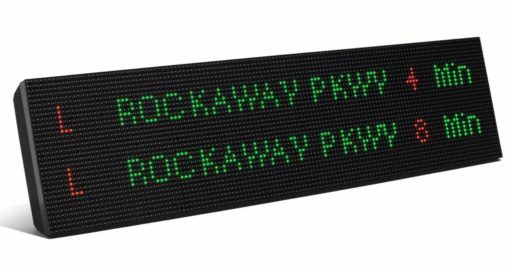 Through their own API, they then access “official MTA data” that provides the latest train information onto the LED matrix. When you get it home or to your workplace, you only need to connect to wifi so it can access a live feed of train arrivals and departures. The NYC Train Sign can show up to 2 train times in either direction. And there shouldn’t be any noticeable delays between what the MTA puts out and what NYC Train Sign displays. Does NYC Train Sign Work for MTA Bus Routes and Other Trains? A: Unfortunately not even the MTA has that data. I can only program for lines that physically have LED signs on their platforms. Technically the S and Sir are also available. I can substitute schedule values, but they wont be live. However, NYC Buses and other non MTA Subway trains are available live! Review: Is the NYC Train Sign Worth It? The startup sells the regular-sized signs for $299 and a mini version for $149, so it’s not a complete no-brainer. However, if you live near a train and rely on the subway to get everywhere in the city, you can’t beat the convenience of just looking up and seeing when the next train is. Don’t forget that it’s also a nice piece of decor and a conversation piece. It’s really useful for those that live right by a train, especially on those extremely cold or insanely hot summer days. If the NYC Train Sign also displays when a train is delayed significantly, that would also be a huge plus. Functionally, it all really depends on how much real-time data is worth to your life. The NYC Train Sign isn’t just limited to displaying the minutes before the L Train comes, but it can also display a personalized text, a logo, and provide real-time weather updates. The NYC Train Sign started out as a personal project by T Timothy Woo, who created the prototype in 2016. In early 2017, he started an IndieGogo campaign and despite the hype we’ve seen around the product, the campaign surprisingly only raised a third of their $15,000 goal. You can order it on their website, or follow them on Instagram, Facebook, or Twitter. CAUTION: Do NOT buy this item. I ordered a train sign on December 7, 2017. Today is February 8, 2018. It has been over three months and my sign has not arrived. The company has sent generic responses to my three follow-up emails (once per month) asking for status updates. They will not tell me where my sign is and will not give an accurate estimate of how long until it arrives (in late December they said early January; they later said late January; it’s now February). This is a cool idea and I really, really wanted one. But so far I’m just out $200 and have no product to show for it. I sincerely recommend that you do NOT purchase one. Check their Google product/company reviews and you’ll see this is the standard experience.